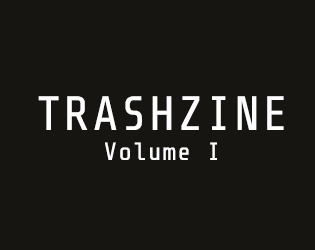 After many months of work by a dedicated group of volunteers, here it is: the inaugural volume of TRASHZINE, featuring personal interviews with over a dozen gamemakers. We’re incredibly proud and excited to share this with you, hoping it will point you towards interesting work, inspire you, and showcase the diversity of the indie game development scene. We’re hoping this project will inspire more volumes, always shedding light on more small game creators. BUT NICE FIRST ISSUE. LONGER INTERVIEWS WOULD BE APPRECIATED!